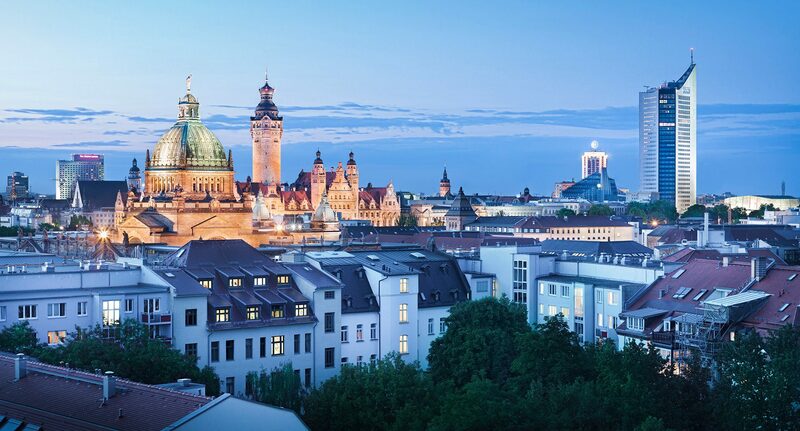 Leipzig is a young, green, and vibrant city in the middle of Germany. Leipzig is a very interesting city for life and work, especially for young families. Leipzig is one of the fastest growing cities in Germany. Currently there are around 590,000 inhabitants – and the number is rising. The proximity to Berlin and the accessibility of other large cities makes it so interesting. Leipzig has the largest terminal train station in Europe and the oldest in the world, an airport and a well-developed rail and road network with several highways around the city. There are over 40,000 students. The University of Leipzig consists of fourteen schools and 150 institutes, Alma Mater Lipsiensis is a traditional classical university. In addition, there are several other institutions of higher education. For example, the University of Applied Sciences, the University of Music and Theater, the University of Telecommunications, the Graduate School of Management, the University of Applied Sciences or the Leipzig University of Media. For those interested in research, Leipzig offers many promising opportunities. The research facilities provide an ideal working environment for both beginners and experienced researchers. Whether photovoltaic, holography, heart catheter, stem cells or biomass – all this is researched, developed and produced in Leipzig. For example, the BIO CITY LEIPZIG, several Fraunhofer Institutes, the German Biomass Research Center, the Helmholtz Center, some Max Planck Institutes and many more. In addition, many national and international companies have settled here in recent years. New production sites in the fields of energy, IT, logistics and industry emerged – including Porsche AG, BMW, DHL, Amazon and many more. Leipzig is a vibrant cultural city. It has been awarded, among others, the European Cultural Heritage Label. Leipzig’s international reputation as a city of music is closely linked to the Gewandhaus Orchestra, the Thomanerchor, the Thomaskirche and the opera house. There is a growing theatrical and cultural scene, which attracts mainly international creative people and makes the city lively and interesting. Leipzig is considered a book city with the German National Library and a striking number of start-up companies. The Leipzig football team gained national recognition with an unprecedented rise in the league.